November 2018 through April 2019 Sharon & Jon welcome you to the winter wonderland of Copper Mountain, Colorado - home of the fabled High Rocky powder and a hidden gem that the locals would like to keep a secret. ​We are excited to announce that after three years of exclusively training instructors and working as a supervisor, Jon is back to teaching at Copper Mountain. ​Jonathan Lawson, aka Jonnie Law, has taught more than 30,000 hours of lessons to skiers and instructors. In the 25 years since becoming a Level 3 certified professional, he has learned from some of the best minds in the ski teaching world and integrated their lessons into his own skiing and teaching. Jon has been recognized as one of the Top 100 Ski Instructors in North America and in 2011 he was a finalist for Colorado Ski Instructor of the Year. He can teach and guide in any terrain on the mountain and he loves to teach skiers in a way that they develop their own love for the sport. Read more about Jon's story here. "Even as my lessons [with Jon] became more advanced, they never lost the original patience, passion, customized teaching style, and genuine interest in my progress as a person." We love custom requests! Would you like a private ski lesson with Jon or a private yoga or Reiki session at your condo or chalet with Sharon? ​Looking for a place to stay in a good location? We are Copper Mountain locals and we'd be happy to create a custom vacation package and show you around. Email Us. I learned so much right away. Jon has this way of explaining things that takes the impossible and makes it achievable. It is as if he is able to go into your brain, understand how you learn best, and then break the skills down into small pieces that resonate with you and make sense. He was full of patience for my learning process and passion for the sport and lifestyle. I am proud to say I can now take on any run on the mountain or back bowls with total confidence. Even as my lessons became more advanced, they never lost the original patience, passion, customized teaching style, and genuine interest in my progress as a person. Learning with Jon never feels repetitive or boring, but instead like a fun day of shredding with your friend. Over the years, Jon has continued to take time out of his day to coach my skiing, and usually my life a bit too. Lessons from a chairlift ride up the mountain with him prove to be just as valuable as the lessons and drills used to go down. I am so thankful I became his student on that first winter day, and I am excited for all of the future students to discover their passion of skiing with Jon." Jon has a life-long passion for skiing and it shows every minute. Whatever Mother Nature (or Ullr depending on how you roll snow-spirit wise) brings, you want to get the most out of it. 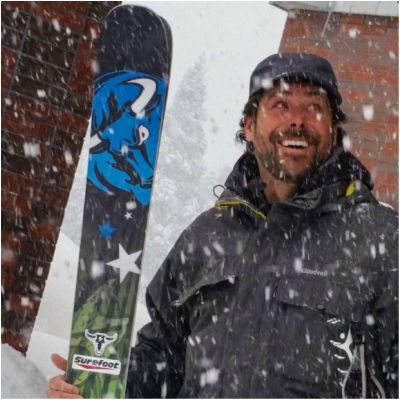 Jon has both the classic training (as an instructor-of-ski-instructors) and the guiding knowledge to craft an experience that finds the "goods" and ups your ski game. Whether you want to charge untracked powder in the backcountry all day, work on the finer points of tree skiing, or just play around in your comfort zone, Jon will tailor a ski experience that keeps a smile on your face from first tracks to last chair. If you're looking for something out of the ordinary, away from the corporate packaged "experiences" - go freestyle, go with Zelement!"